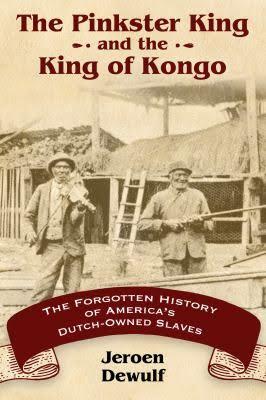 The Pinkster King and the King of Kongo (University of Mississippi Press, 2017) presents the history of the nation's forgotten Dutch slave community and free Dutch-speaking African Americans from seventeenth-century New Amsterdam to nineteenth-century New York and New Jersey. It also develops a provocative new interpretation of one of America's most intriguing black folkloric traditions, Pinkster. Jeroen Dewulf rejects the usual interpretation of this celebration of a "slave king" as a form of carnival. Instead, he shows that it is a ritual rooted in mutual-aid and slave brotherhood traditions. By placing these traditions in an Atlantic context, Dewulf identifies striking parallels to royal election rituals in slave communities elsewhere in the Americas, and he traces these rituals to the ancient Kingdom of Kongo and the impact of Portuguese culture in West-Central Africa. Dewulf's focus on the social capital of slaves follows the mutual aid to seventeenth-century Manhattan. He suggests a much stronger impact of Manhattan's first slave community on the development of African American identity in New York and New Jersey than hitherto assumed.